If you're a busy executive who travels often, a frequent flyer or simply looking for a reliable and affordable SFO airport car transfer and ground transportation services, then SFO-Oakland Airport Car Service is your best bet; with a complete fleet of new model luxury Mercedes and BMW black Sedans, economy MKT sedans, executive SUVs and Mercedes Sprinter mini coaches, you're sure to find just the right vehicle for your group and budget. SFO-Oakland Airport Car Service offers multiple ground transfer services to and from SFO airport, black car service and private chauffeur services throughout the bay area 24/7, and an array of deeply discounted specials, package deals, hourly (as directed) and business reduced rates, so that you're always saving more with us, and without having to sacrifice service quality. SFO-Oakland Airport Car Service is a premier ground transportation service, offering professional ground transportation services for more than 2 decades, our team of professional reservationists, account executives and chauffeurs are available 24/7 to assist you with all of your travel needs and corporate events at no additional cost, so whether you are looking for a luxurious chauffeur service or an economy transportation in San Francisco, Oakland or anywhere in the bay area, look no further. We have it all. Why take a chance with an online broker who's going to source out your ride to the lowest bidder, not knowing whether your ride is going to show up at all, or unreliable taxi and national transportation services, when you can hire a professional, reliable service for less? 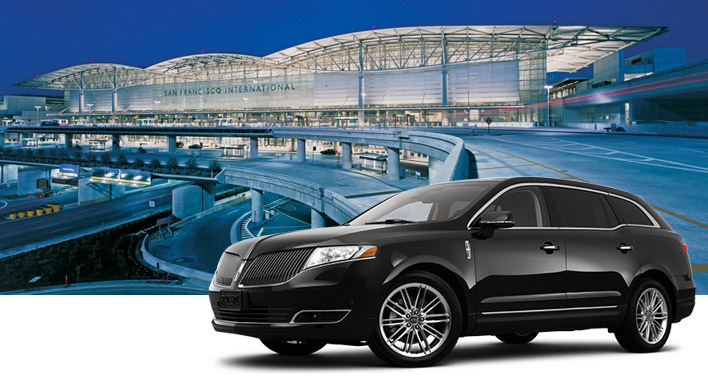 Check out our late-model Mercedes s550 and BMW 740 black cars, or if you're on a budget and yet looking for great service that offers brand new vehicles and professional chauffeurs, then our Lincoln MKT sedans and Suburban SUVs will be perfect for your airport rides, or general ground transportation needs, we also offer new Mercedes Sprinter mini coaches for group transportation regardless of the purpose of travel, group size and destination. Call us today for vehicles availability, current special offers, package deals, business rates and book your SFO airport ride instantly!